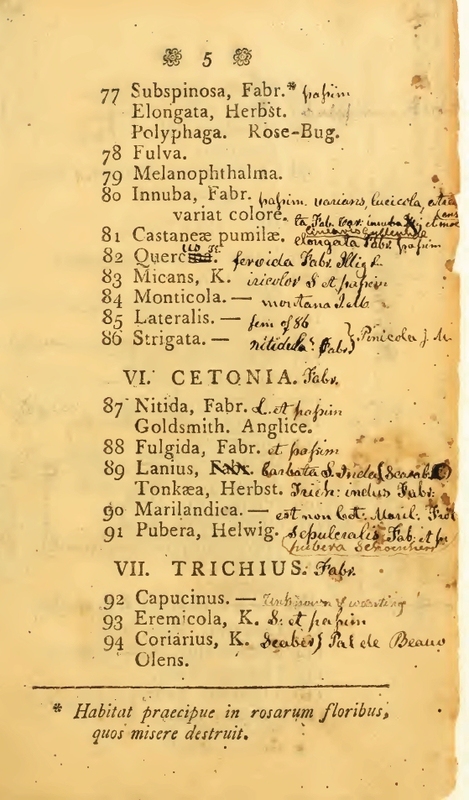 Came upon the copy of A Catalogue of Insects of Pennsylvania that is available on the Internet Archive is quite a special one as it contains marginal comments and additions in Melsheimer's hand as well as that of his son, John Frederick Melsheimer. 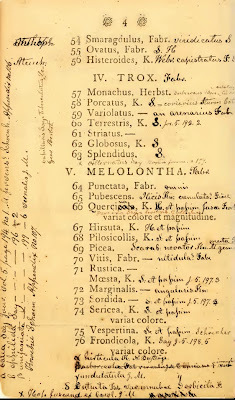 Melsheimer's insect collection would serve as the basis for the collection at Harvard University. Schwarz 1895 (Proc. Ent. Soc. 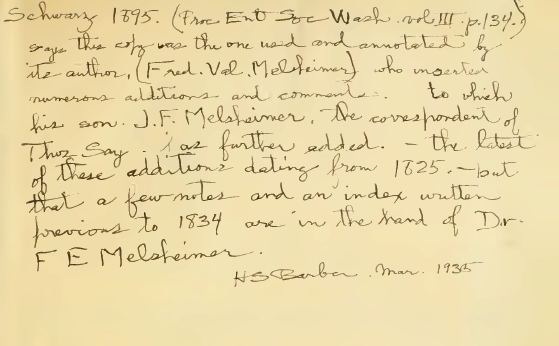 Wash. vol III, p. 134) says this copy was the one used and annotated by the author (Fred. Val. 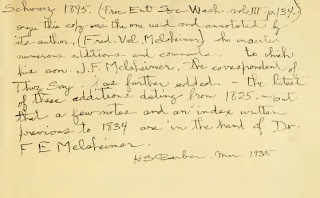 Melsheimer) who inserted numerous additions and comments. to which his son J.F. Melsheimmer, the correspondent of Thos. Say, has further added.--the latest of these additions dating from 1825.--but that a few notes and an index written previous to 1834 are in the hand of Dr. F.E. Melsheimer. H.S. Barber, Mar. 1935. 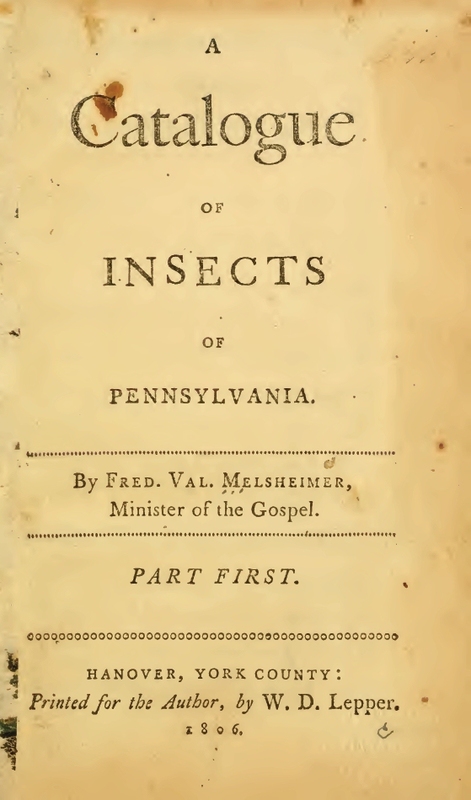 "The Reverend Frederick Valentine Melsheimer (September 25, 1749, Negenborn, Brunswick – June 30, 1814, Hanover, Pennsylvania) was a Lutheran clergyman and early American entomologist, called the "Father of American Entomology" by successor Thomas Say. 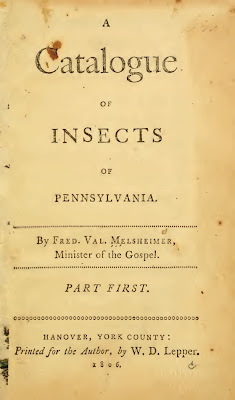 He was the author of the first major entomological work in the United States: A Catalogue of Insects of Pennsylvania (1806), a sixty-page work that describes 1,363 species of beetles. His insect collection, inherited and increased by his second son Frederick Ernst Melsheimer and his son's friend Daniel Ziegler, was eventually purchased by Harvard University and formed the basis for what is now the largest university-owned collection of insects in the United States. His Catalogue was intended to be a three volume work, but illness prevented publication of more than the first volume, in 1806. 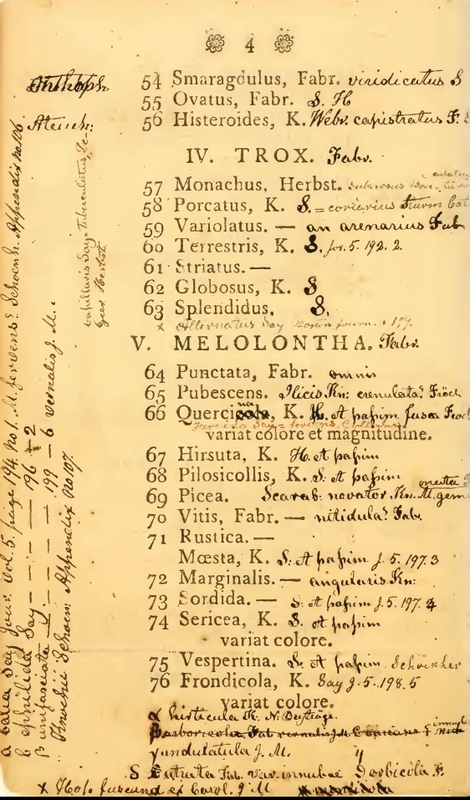 Melsheimer was also interested in mineralogy and astronomy, and served as Professor of Languages at the recently-founded Franklin College in 1787. He died in 1814 of lung disease. Two of his eleven children also devoted themselves to natural history: John Frederick Melsheimer (1780-1829) and Frederick Ernst Melsheimer (1782-1873)." I hereby offer to the Friends of Natural History a Catalogue of Insects, in the Collection of which I have spent my Hours of Recreation for some Years past. To the best of my Knowledge I have but few Predecessors in the United States in this Undertaking. For this Reason I may calculate on the Indulgence of the experienced Naturalist; in case some slight Errors should be found in it. — It is an undeniable Fact, that Entomology has been considerably extended by American Insects; but yet there are many non-descript Genera and Species, to be met with by an observant Naturalist, which fully repay the Trouble of his Exertions. Hence arise the urgent Requests, and Invitations of European Naturalists; Pience the ardent Desire to possess American Insects: and this is likewise the strongest Excitement for American Entomologists to make them- selves more intimately acquainted with the Productions of their Country. Should the present Undertaking meet the Approbation of the Friends of Natural History in the United States, then this Catalogue will be continued from Time to Time. The Subscriber at the same Time is willing, if approved of, to exchange such Insects, as he possesses in duplo, for others which are wanting in his Collection. Such as as he has but one Subject of, are marked thus — all others not so marked may be had m Exchange. Should there be any Friends of Natural History, who would wish for a Collection of Insects, I am proposed to supply them with one Subject of each Species at the Rate of Five Dollars per Hundred. 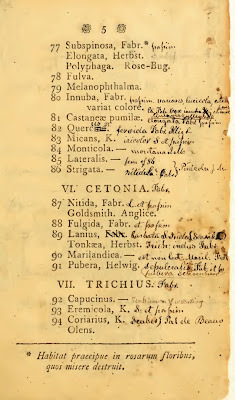 In the Classification of my Collection I have followed the System of Fabricius; although I wish it to be known, that I am much indebted for the Arrangement relative to Classification to the Instructions of Professor Knoch in Brunswick, in Germany, with whom I have corresponded for many years past. In the Catalogue his Suggestions will be found marked with the Letter K. With Pleasure I should have made some Observations on, and given a short Description of some of the most important Subjects, if Time and other Occupations had permitted. Probably it may yet be done in a Supplement to the Catalogue now contemplated to be published. Hanover, York County & State of Pennsylvania, August 1806. Fred. Val. Melsheimer, Minister of the Gospel.